I'm going to be on a lot of panels at the show this weekend. It's hard to believe it's here already, but I'd love to see you there. Unlike year's past, I will NOT be having a table to sell books from. At this point, I have one signing at the Shadow Mountain Booth, so if you want to grab a book or have it signed, you're going to need to do it there during that hour. And you're going to want to do that anyway since I'll be sitting next to Claudia Gray and she'll be signing nifty new posters for her new Star Wars book I can't wait to get my hands on. Here's a link to my schedule in case you want to check it out from the FanX website, but I've included it below as well. The mysterious Kylo Ren shocked the galaxy with his actions in The Force Awakens. But what drives the man behind the mask? Our panel gets to the bottom of what makes him tick... Fellow panelists include Jimmy Martin, Holly Frey, Danielle Uberalles, and Robert J. Defendi. There is an epidemic across all fandoms of bullying and gatekeeping: fans who try to decide who is and who isn't a fan of a thing. Our panel discusses strategies to break down this toxicity in Star Wars and other fandoms that have become wretched hives of scum and villainy. Fellow panelists include Lucasfilm's Matt Martin, Dawn Pink, Leigh George Kade, Debra Jensen, and Brooke Heym. Our panel of world-renowned podcasters talks to you about podcasting and their misadventures over the years so that one day you might have a successful podcast, too. Fellow panelists include Kerry Jackson from The Geekshow Podcast, Holly Frey from Stuff You Missed in History Class, and Dan Wells from Writing Excuses. What was it like being a Star Wars fan between 1984 and 1996? Our panelists tell reminisce and offer a history lesson about how cool Star Wars WASN'T for the longest time. Fellow panelists include Lucasfilm's Pablo Hidalgo and Matt Martin, Star Wars authors Kevin J. Anderson and David Farland, and the Geek Show's Leigh George Kade. Learn what techniques in storytelling, cinema, and editing, that George Lucas used to create the greatest space saga of all time. From tricks in editing and pacing to how to steal like the best, it'll all be covered. Fellow panelists include Pablo Hidalgo and Tom Spina. Anakin Skywalker and his son Luke are more alike than people realize. Learn how their stories echo one another and why Attack of the Clones and The Empire Strikes Back could be easily considered sister films. Fellow panelists include Lucasfilm's Matt Martin, Ben Lane Hodson, and Cheree Alsop. Directors Rian Johnson and Colin Trevorrow are confirmed for the next two installments of the Star Wars saga, but what else do we know? Our Star Wars experts dish on what they know and what they don't know. Fellow panelists include Holly Frey, David Farland, Jeremiah Lupo, Aaron Sagers, and Robert J. Defendi. How and why elements from the original Star Wars Roleplaying game have made their way into the Star Wars universe. From Interdictor Cruisers and Strike Force Shantipole, we talk about how the RPG from the 80s is still leaving a mark on Star Wars. Other panelists include Lucasfilm's Pablo Hidalgo, Geek Show's Leigh George Kade, and Big Shiny Robot's Mark Avo. 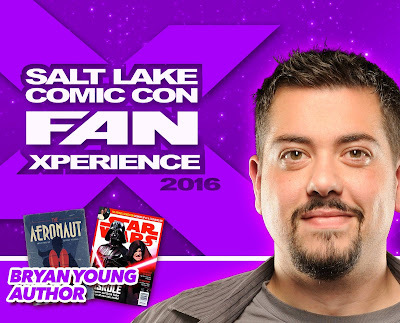 I'll be signing books and Star Wars Insider magazines (those you bring and those they'll have on sale.) I'm scheduled to appear signing next to Claudia Gray, so don't miss this. The Star Wars costume clubs gather to tell you what it's like to be among their ranks and answer questions about the differences in their clubs. Those who work in journalism and other similar fields have been put in many bizarre situations with many celebrities. Our expert panel spills the beans on the most awkward and fascinating experiences they've racked up to date. Fellow panelists include The Geek Show's Kerry Jackson, Shannon Barnson, and Jimmy Martin. Holly Frey and Special Guest Host Bryan Young will talk about the little-known history of Salt Lake City and Utah and their role in the history of cinema. From Chaplin and the Marx Brothers to John Ford and John Carter, this promises to be a fascinating history lesson. I will be hosting the Q and A with Jason Isaacs who played Lucius Malfoy in the Harry Potter films as well as voiced the Grand Inquisitor on Star Wars Rebels. Claudia Gray was a successful author before Star Wars took over her life, but Lost Stars propelled her through the stratosphere. Come hear her discuss her work before and after her abduction into a galaxy far, far away. Holly Frey and Special Guest Host Bryan Young tackle this Indiana Jones-inspired topic. What was the real-life story of Hitler's quest for religious artifacts? How much did the films get right? Is truth stranger than fiction? Find out in this special, double-sized panel and bring your questions for Holly about the show, there will be a question and answer period! Star Wars Land is coming to Disney Parks before the end of the decade. What do we know? What have we seen? What should we expect? What Star Wars has ALREADY been incorporated into the parks? Love Star Tours? Then this is the panel for you. Fellow panelists include Holly Frey, Kerry Jackson, Jon Smith, Travis Tate, and Valerie Cameron-Walker. And that's it for my panel schedule. It's a long one. As for my writing lately: I did my first of two pieces on the end of Scott Snyder and Greg Capullo's run on Batman. This one was for Howstuffworks. Huffington Post is getting the next part. Then, I wrote a new piece for Salt Lake City Weekly I'm pretty proud of about the cognitive dissonance I see between voting conservative and being a nerd. It's called Pop Politics. And then my newest Ridiculous History piece is about The Curse of the Colonel. It was an extremely fun one to write.